Passport Book: U.S. Passport Books are valid for travel by United States citizens anywhere in the world, although travel to certain countries and/or for certain purposes may require a visa. Passport Card: The U.S. Passport Card can be used to enter the United States from Canada, Mexico, the Caribbean and Bermuda at land border crossings or sea ports-of-entry and is more convenient and less expensive than a passport book. The passport card cannot be used for international travel by air. Like the traditional passport book, it reflects the bearer's origin, identity and nationality and is subject to existing passport laws and regulations. All U.S. citizens may apply for a passport card. If you have a U.S. passport book and are eligible to use Form DS-82, you may apply for the card by mail. You can use Form DS-82 to renew your passport book at the same time that your apply for your passport card. If you have never had a U.S. passport book or are not eligible to use Form DS-82, you must apply in person using Form DS-11. Make an appointment to apply for your chosen passport. This can be done at the passport agency of your choice or at the San Diego Passport Services office. Please Note: Forms for applying and renewing your passport are also available at your local post office! A completed UNSIGNED application filled out in black ink. Note: You must sign the application in front of the passport agent. Submit a photocopy showing the front and back of the original Identification document presented. Copy must be one-sided on plain white, 8-1/2" x 11"standard paper. Bring one (1) color passport photo, 2" x 2" in size, taken within the past six (6) months. Please check the Passport Agency website for further requirements regarding photos (link is external). The City Clerk accepts personal checks or money orders ONLY. No cash, credit or debit cards are accepted! Bring the required amount, as a money order or check, in reference to the fee chart below. First determine if you can renew your passport by mail. You still have the same name, or can legally document your name-change. Complete the passport renewal application. Go to the Online application to see which option is best for you. Bring the required amount of money, as a money order or check, in reference to the fee chart above. You can and should renew your passport before it expires. If your passport expired less than five years ago, you can still renew it (as you are allowed to renew your passport within 15 years of having received it. 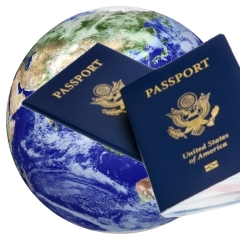 If traveling to many countries, your passport expiration date must extend six months longer than your intended stay. Please keep this in mind if your passport has less than a year left until its expiration date. To speed the passport application process along you may pay extra for an expedited passport and overnight delivery. Costs are shown in the fee schedule above. Passport Cards are delivered by First Class Mail and cannot be overnighted. Even if you have a Passport Book, if you travel by land to Mexico frequently, it might be safer and more convenient to pay $30 to get a Passport Card as well.